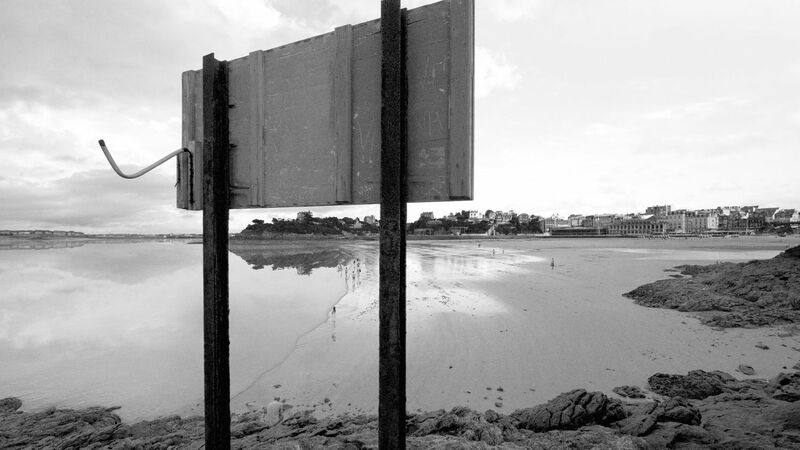 David Claerbout, The Quiet Shore, 2011. Video still One-channel video projection, b&w, approx. 32 minutes. Courtesy of David Claerbout, Sean Kelly Gallery, New York, and Galerie Esther Schipper, Berlin. 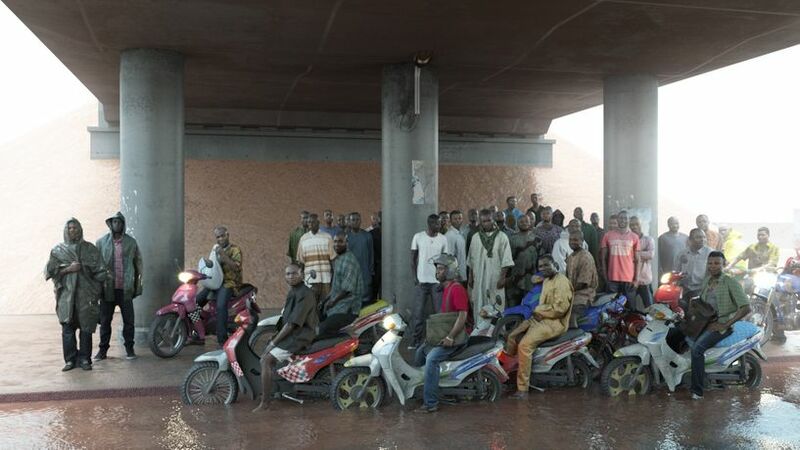 David Claerbout, Oil workers (from the Shell company of Nigeria) returning home caught in torrential rain, 2015. Video still, one-channel video projection, HD animation, silent, looped. Courtesy of David Claerbout, Sean Kelly Gallery, New York, and Galerie Esther Schipper, Berlin. David Claerbout, The Pure Necessity, 2017. Single channel projection, 2D-Animation, 50 Minuten. Installation view, Unlimited Basel 2017 presented by Gallery Sean Kelly, New York and Gallery Esther Schipper, Berlin. Photo: Andrea Rosetti Courtesy of Gallery Esther Schipper, Berlin. The Belgian artist David Claerbout works in photography, film, video, sound, digital media, and drawing. He is known for his sequences of imagery that have been slowed to the extreme, images which are actually moving become almost motionless. The Belgian artist David Claerbout works in photography, film, video, sound, digital media, and drawing. He is known for his sequences of imagery that have been slowed to the extreme, images which are actually moving become almost motionless. Claerbout achieves these effects employing sequences of slides or by computer generated methods that enable imagery to become as frozen as stills. The result is increased attention on the part of the viewers, who surrender to decelerated time and adapt to it. Its auric presence and sensitive lighting make Kunsthaus Bregenz an ideal site for such a form of perception. 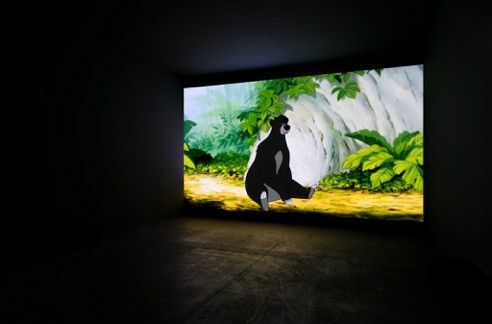 For Die reine Notwendigkeit / The Pure Necessity, 2016, Claerbout subjects the 1967 movie of the children's book classic The Jungle Book to a reworking. The animals are not presented anthropomorphically, but to revert them to behaviors appropriate to their species. Olympia (The real time disintegration into ruins of the Berlin Olympic stadium over the course of a thousand years) (2016), is a digital reconstruction of the Olympic Stadium in Berlin. David Claerbout scanned each stone of the famous Nazi building to create a deceptively real 3D version. Its representation in real time has been calculated to last for a thousand years. Stones erode and plants sprout. Even the current weather conditions are simulated by data from a webcam – if the sky over Berlin is cloudless, it is likewise so in the film. “With any technological device, the first thing that is lost is the sensation of synchronicity. (…) The way the camera moves autonomously, without any operator, indicated that it’s a completely synthetic situation,” as David Claerbout stated in an interview with Elise Lammer, quoted from Spike Art Quarterly, no. 53, 4/2017. Claerbout not only calculates and renders the future but also the present. Olympia is a meditation on time and perception, Impressionism in the digital era. David Claerbout, born 1969 in Kortrijk, Belgium, studied painting in Antwerp; he lives and works in Antwerp and Berlin. He became increasingly interested in time as a result of his investigations into the nature of photography and film. Fusing together the past, present and future into stunning moments of temporal elasticity, his works present profound and moving philosophical contemplations on our perception of time and reality, memory and experience, truth and fiction. He has been the subject of numerous solo exhibitions internationally, including: Van Abbemuseum, Eindhoven (2005), Centre Pompidou, Paris (2007), Kunstmuseum St. Gallen (2008), De Pont, Tilburg (2009 and 2016), WIELS, Brussels (2011), SFMOMA, San Francisco (2011), Tel Aviv Museum of Art (2012), Wiener Secession (2012), Kunsthalle Mainz (2013), Nederlands Fotomuseum, Rotterdam (2014), Marabouparken, Sundbyberg (2015), KINDL ¬– Centre for Contemporary Art, Berlin (2016), Städel Museum, Frankfurt/Main (2016), MNAC, Barcelona (2017), as well as Schaulager, Münchenstein/Basel (2017). His work is represented in major public collections worldwide.